“We are not a smart, social regiment. We do not seek to be ever in the headlines. We do not pretend to have some special expertise. Indeed perhaps what makes us special is that we do not seek to be any of those things. We are ordinary, straight-forward folk who stick together. We have in the Dukes some of the best soldiers in the world. I would back the ‘Dukes’ soldier – the good, honest straigh-forward, hard working Yorkshireman – against any soldiers in the world. From these first class soldiers we have consistently obtained outstanding Senior NCOs and Warrant Officers and hence have always had a very powerful Sergeants’ Mess. In 1702 Colonel George Hastings, Earl of Huntingdon, was authorised to raise a new regiment, which he did in and around the city of Gloucester. As was the custom in those days the regiment was named Huntingdon’s Regiment after its Colonel. As Colonel succeeded Colonel the name changed. In 1751 regiments were given numbers, and the Regiment was from that time known as the 33rd Regiment of Foot. 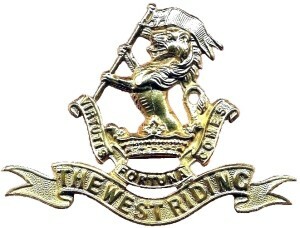 In 1782 the Regiment’s title was changed to the 33rd (or First Yorkshire West Riding) Regiment, thus formalising an association with the West Riding which, even then had been long established. The First Duke of Wellington died in 1852. In the following year the Regiment’s title was changed to the 33rd (or The Duke of Wellington’s) Regiment, by Queen Victoria. In 1881 the 33rd was amalgamated with the 76th Foot, which had been raised in 1787 and became the 2nd Battalion of The Duke of Wellington’s Regiment. In 1877 the Depot of the Regiment was established at Halifax. In 1948 the 1st and 2nd Battalions were amalgamated into a single battalion,1DWR. The 1DWR has served with distinction in many of the world’s modern trouble spots. In Korea, the ‘Dukes’ desperate defence of the Hook position halted the last major Chinese attempt to break the UN line before the truce, in July 1953, brought the war to an end. In Cyprus the Battalion was successful in Operation Golden Rain, destroying a major EOKA terrorist group operating in the Troodos Mountains in 1956. In 1964 the Battalion joined the NATO deterrence in Germany on the front line and from 1971 was regularly engaged in ‘the Troubles’ in Ulster until 1997. In 1993 a peacekeeping tour in Bosnia was the setting for the first ever award of the Conspicuous Gallantry Cross, to Cpl Wayne Mills. A hasty deployment to Iraq in 2003 resulted in the award of the Theatre Honour ‘Iraq 2003’. Then the following day it was given the Key to the Town of Erquinghem Lys, France. It was the only British Military Regiment to be so Honoured by any French Town. Interspersed with these active service deployments have been many memorable postings, tours and exercises, including The Caribbean, Hong Kong, Kenya, Belize, Canada and the Falklands. On 6th June 2006 The ‘Dukes’ were amalgamated with the Prince of Wales’s Own Regiment of Yorkshire and The Green Howards to form, respectively, the 1st, 2nd and 3rd Battalions of the Yorkshire Regiment. On July 25th, 2013 the 2nd Battalion was merged into the other two. The 1st (PWO) Battalion took over the Colours of the 2nd Battalion (Green Howards) and renumbered as the new 2nd Battalion (2 Yorks). The 3rd Battalion (DWR) was then renumbered as the new 1st Battalion (1 Yorks).